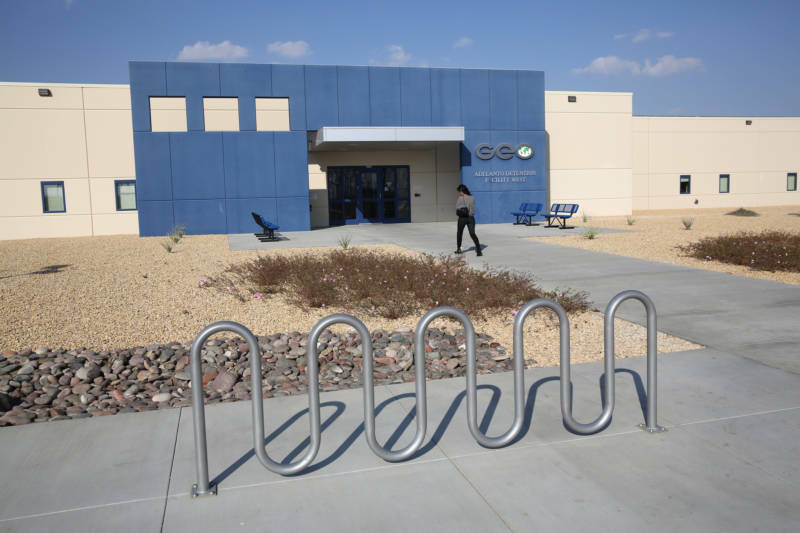 The city of Adelanto will terminate a long-standing contract with the operator of California's largest detention center, located in rural San Bernardino County. Last fall, inspectors from the Department of Homeland Security found inadequate medical care and other serious violations of U.S. Immigration and Customs Enforcement’s own detention standards at the facility. Activists have also long complained about conditions, including high suicide rates, lack of access to medical care and harsh conditions. Thousands of immigrant detainees are currently being held in California, according to federal government data. The state holds the second-highest number of detainees after Texas. In a March 27 letter to GEO Group, Adelanto City Manager Jessie Flores informed the private prison operator that the contract would expire in 90 days. GEO Group can detain up to 1,940 immigrants at the Adelanto facility. ICE spokeswoman Lori Haley said in a statement that "ICE plans to continue to use the Adelanto ICE Processing Center as long as a viable contract is in effect with the facility." It's unclear what will happen to detainees if the facility is no longer available. Haley said that ICE will decide whether to continue to hold or transfer detainees on a case-by-case basis. "We are calling for a just and proper closure at all the facilities where ICE contracts have been terminated," said Liz Martinez with Freedom for Immigrants. However, Martinez is concerned that the facility closure could make it harder for detainees' families to reach them if they are transferred out of state. "They [ICE] have prosecutorial discretion to detain someone in the first place, to release them as well," Martinez said. "They don't have to transfer them at all." Haley said that ICE considers where detainees were arrested when deciding where to transfer them. "Whenever possible, ICE seeks to house detainees within the geographical area of their arrest so they can be close to family and attorneys, and reduce the need for transfers," she said. Advocates were also disappointed that the decision was made in closed session, with no public input. City officials did not respond to requests for comment Friday. GEO Group referred all questions to ICE. In 2016, ICE held 16 contracts with California municipalities, but some were with agencies that lacked space to hold detainees. After state lawmakers enacted SB 29, which restricted local municipalities from expanding their contracts with ICE, there's been a string of terminated contracts. Since then, nearly all of the local government agencies in California that detained immigrants for the federal government decided to terminate those lucrative agreements. Earlier this week Orange County officials announced they would no longer detain immigrants facing deportation in local jails. Last year, the city of McFarland ended its contract with GEO Group to run Mesa Verde, the second-largest immigrant detention facility in the state. Contra Costa and Sacramento counties also ended contracts with Immigration and Customs Enforcement in 2018. Santa Ana ended an agreement with the federal government in 2016, before the passage of SB 29. Imperial Regional Detention Facility is privately operated by Management Training Corp. through a subcontract with the city of Holtville. It can hold up 704 detainees. Yolo County Juvenile Detention Facility is a juvenile hall operated by the Yolo County Probation Department. It can hold up to 24 detainees between 13 and 17 years old. Yuba County Jail is a county jail operated by the Yuba County Sheriff's Office. It can hold up to 220 detainees. Hundreds of people are also still being held at the Otay Mesa Detention Facility, which is privately operated by CoreCivic, which directly contracts with the federal government. Because the contract does not go through a California municipality, it does not face the limits that SB 29 imposed on detention expansion in the state.